Foreman is a mod for manipulating blueprints in game. This is probably one of the last updates where Foreman will be able to import blueprintstrings. Use the new vanilla blueprint Library (press B by default) to store your blueprints and create strings. 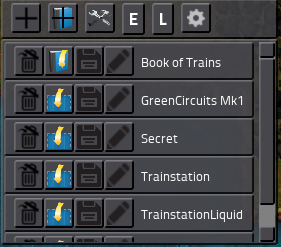 You can no longer export blueprints, only import them from the old BlueprintString/Foreman format. The new vanilla format will not be supported. Depending on how the modding API for the library turns out i might keep up the ability to store blueprints in Foreman. Foreman will (given time) turn into a blueprint manipulation tool. Replace entities in the blueprint with another one: Click the empty buttons with an item on the cursor. Click "Ok" with a blueprint/book to replace. added option and console command to hide the main button. readded script input. Strings starting with "do local foo" or "do local script" are treated as script input.